The Goldings, hoping stay in the western U.S., began looking for good farmland, first in California, then in Colorado and New Mexico. It was all too expensive, Diane said. So they decided to move back East to be near Diane's parents in Massachusetts. 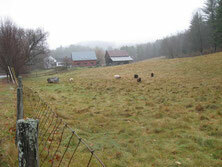 They chose West Brattleboro where they lived on a five-acre farm for nine years. Then they spent a couple years on Main Street in Newfane where Tom had a thriving business making custom furniture and wood carvings. Meanwhile, while driving her older son Seth to a friend's home in Saxtons River one day, Diane passed a farm for sale. They eventually bought Meadowsweet Farm in 1999 and Tom immediately began building a large two-story barn. He put in plenty of large windows on the first floor where the machining would be done. The second floor, which is used to process orders, conceive designs, tests tools and send out products and bills was made even more bright and sunny. There are ten skylights on the roof and a wall-size window on the south side and sliding glass doors leading to a deck on the north side. And it all takes just one cord of wood to heat in the winter. With fleece from the sheep, the next natural step was to learn to spin so she asked Tom to make her a drop spindle. A drop spindle is an evolution of the handspindle, an ancient tool used by many cultures for making yarn. It has a straight shaft that goes through the middle of a spherical object or wheel called a whorl. It has a hook, groove or notch to guide the fiber that is twisted or rotated by hand to yarn. Each whorl has a one-of-a-kind carving or decorative top that may be hand-painted, made from an enamel pill box top, an unusual button or even a scrimshaw carving, soldered stained glass or hammered brass. The spindles come in different diameters to accommodate different yarn weights. Noticing that there was a large spinning community out there, Tom began focusing on other fiber tool products. It was a natural progression to go from making a drop spindle to a spinning wheel, which is now his main product. The spinning wheel that Tom designed took several prototypes, Diane said. Tom would make one and Diane would test it telling him how it was reacting. Diane also tests all the spinning wheels now made before they are shipped to their owners all over the world. Tom calls it a real ma and pa operation. The spinning wheel Diane demonstrated was heading for California for a woman who loved Savannah cats. It is made of black walnut and Savannah cats are carved on the wheel as well as the back of a spinning chair, which has no arms. The post in the middle looks like a fence post. Tom also designed a spinning wheel that has three flyers, which means that a spinner can spin more than one type of yarn at the same time and the yarns can be combined if the spinner wishes. The flyer is the U-shaped part of a spinning wheel that twists (spins) the yarn. The arms of the flyer have threading hooks to allow yarn to wind onto the bobbin. After the development of the drop spindle and the spinning wheel, the Goldings hit the road traveling to fiber shows including one of the largest in Rhinebeck, N.Y. Diane said it would often take more than month to put together everything for that show, taking hundreds of drop spindles with them as well as other fiber tools and spinning wheels. Today, a full-page color advertisement in Spin Off magazine is all the advertising that the company does to fill the demand for Tom's spinning wheel and other products. Tom custom designs about four spinning wheels a year and builds one loom. There's a constant demand for their other products. He has two paid high school apprentices. The help arrive after school. One is from Bellows Union High School and one from Christian Academy in Claremont. 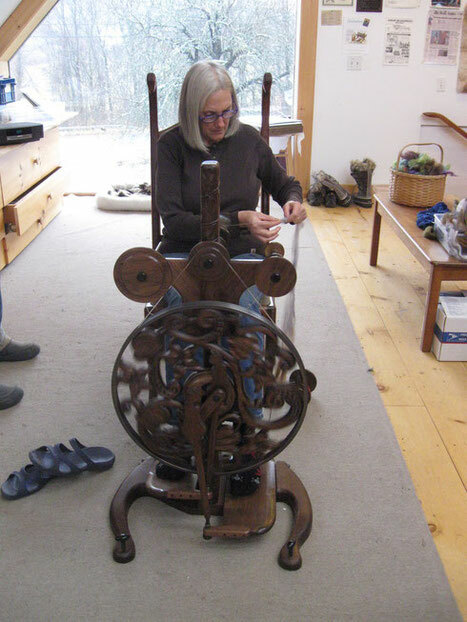 Now that their son Seth is in the business making a less expensive spinning wheel at his operation in Essex Junction, Vt., Diane sees herself back at Rhinebeck and other shows on the East Coast.